I want to reassure you that as your commander-in-chief, I will do everything within my powers to continue empowering you by providing all the necessary equipment, force multipliers and enablers required for you to prevail on the field. I also want you to be aware that I am currently looking into measures to improve your entitlements and welfare generally. The officers and soldiers who are fighting against the curse of terrorism in the North-East deserve all the attention our country’s leadership can demonstrate to them. As president of the country, I am determined to ensure that every citizen feels safe and secure in all parts of the country. To achieve this, the security agencies must rise to the challenge and curb threats to security in our country. The Armed Forces play a critical role in safeguarding the country, hence you must all ensure that your plans and programmes meet the challenges we face. To this end, I am glad that this conference is holding at this time, because it serves as a platform to assess and evaluate your performance for the year 2018. One of the cardinal objectives of this government is security. In this regard, the Nigerian Army’s efforts have led to the dislodgement of insurgents from areas hitherto viewed as their strongholds, rescue of abducted persons, return of internally displaced persons and the gradual return to normalcy in the North-East. The effort of the military has also stabilised the security situation in the Niger Delta and other parts of the country and curtailed the clashes between herdsmen and farmers. I must commend the selfless sacrifices of our Armed Forces, especially the heroic officers and soldiers of the Nigerian Army who, by virtue of their commitment to operations all over the country, have brought about the desired peace. There has been a remarkable improvement in the security situation in the North-East since 2015 when this administration came into government and you are a major part of the successes that have been achieved. The Nigerian Army has enriched her corporate identity, organisational commitment and responsiveness. I also wish to acknowledge the drastic reduction in human rights allegations against the Nigerian Army. I am, of course, aware that in the recent months and in recent days, there have been some operational losses in the northern part of Borno State, particularly in Jilli, Arege and Metele. I know that you are doing your best to reverse this trend and I want to assure you that no effort will be spared in providing the necessary support you require to complete the task. We remain committed to ending the crisis in the North-East and making the entire area safe for all. I urge you all to keep up the good work. I am also painfully aware that some gallant officers and soldiers have paid the supreme price in the course of these anti-terrorist operations. While we remember them and mourn with their loved ones, I must also convey the deep gratitude of the government and people of Nigeria to the late soldiers and their families for their heroic sacrifices. Our thoughts and prayers are also with all other victims of Boko Haram’s atrocities and their families. I will be visiting some of our injured troops in hospitals and also talk to others at their bases to assure them of our continued support. It is a must win war. I want to encourage our troops not to be distracted by whatever speculations but to remain focused and committed to the task of eliminating Boko Haram from the face of the earth. The Nigerian Army’s commitment to upholding democracy is appropriately captured in the theme of this conference, which is “Optimising the Operational Efficiency of the Nigerian Army Towards Safeguarding Democracy and National Security in Nigeria”. As we approach the 2019 general elections, I want to urge all members of the Armed Forces to live up to their responsibilities and remain non-partisan. In addition, you must all remain vigilant throughout the electioneering period and alongside other security agencies, prevent every form of violence that could disrupt the process in line with your Rules of Engagement. I urge you to continue to ensure that all troops remain committed to the observance of all international human rights laws and laws of armed conflict. Let me remind all that the cardinal objectives of this administration remain the entrenchment of security, restructuring the economy and the fight against corruption, to ensure a steady, sustainable and inclusive economic growth. Let me also commend you all for the professional manner with which the Nigerian Army, in collaboration with other security agencies, unravelled the perpetrators involved in the disappearance of late Major General Idris Alkali. This attests to the capabilities that exist within our security apparatus. I want to assure you that the perpetrators will be brought to book. May his gentle soul and the souls of our departed gallant troops rest in perfect peace (Amin). In addition, our commitment to entrenching purposeful and accountable leadership remains firm because it is the base on which peace, security and national development would be built. I, therefore, wish to reiterate that leaders of all strata of society including our Armed Forces must embrace the wind of CHANGE that is blowing across the country for good. There must be cooperation at inter-service and inter-agency levels. To this end, the chief of defence staff and service chiefs must work closely together, as well as with other security agencies, to improve on strategies that will defeat terrorism, militancy and other forms of criminal activities in our country. As you appraise your activities for the year 2018, concentrate on the contemporary security challenges facing our nation and proffer ways of surmounting them. I am convinced that this conference will re-new the vigour and dedication for which the Nigerian Army is known. I have gone through the Conference Programme and it is my belief that the conference will be worthwhile if your deliberations generate new strategies that would strengthen the stability of the country. Muhammadu Buhari (GCFR)is president and commander-in-chief of the Armed Forces of the Federal Republic of Nigeria. 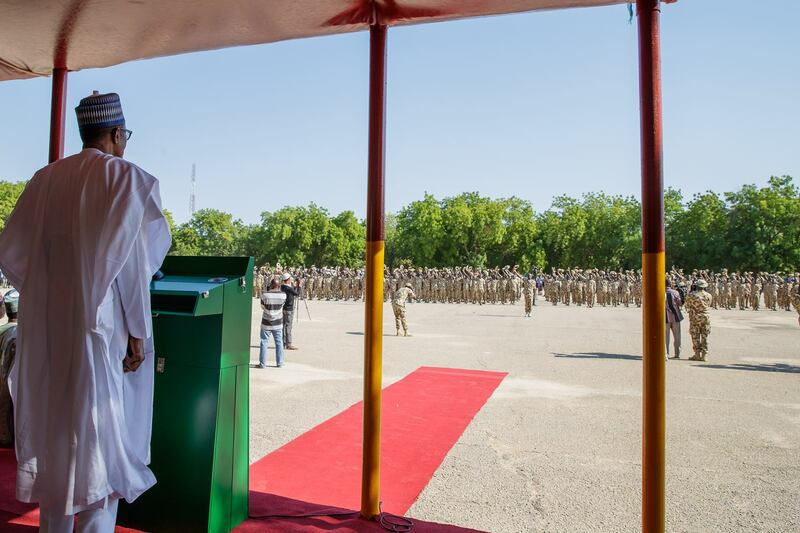 This is the text of remarks made at the opening of the Chief of Army Staff Annual Conference 2018, held in Maiduguri on November 28, 2018.